You’ve hired an RV. Now what to pack? Where Do You Travel with Your Campervan? Sydney is beautiful and there is no reason not to hire a campervan or motorhone. The Opera House and the Central Business District viewed from across the sparkling harbor is one of the world’s great cityscapes. Sydney siders, as the local residents call themselves, are friendly and helpful, and whether you’re in town for a day or a month, you’ll feel right at home. 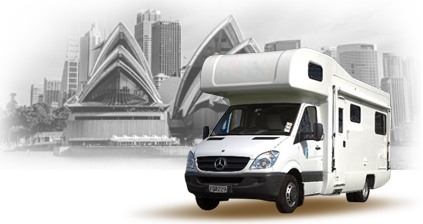 There’s no better way to tour Sydney and all of New South Wales than by using a Sydney camper rental from one of our many suppliers. Sydney itself has lots of things to do and see, but even if you’re just outside the city, you’ll see beautiful landscapes and seascapes, Australia’s unique wildlife, with plenty of places to stop and relax. If you’ve never toured Sydney or its vicinity throughout New South Wales, you’re in for a treat. You’ll start your campervan rental adventure in one of the world’s most exciting cities. Sydney literally offers something for everyone, and there’s no better place to begin your tour. Once you’ve seen all there is to do in Sydney, you can head out on the open road. A campervan or motorhome rental is the perfect way to tour New South Wales. The road trip down the coast will take you past the greatest surf beaches in the world, with lots of fun communities that welcome campervan and motorhome travelers. No matter what your travel budget, you can afford a campervan hire. You can find deals on simple or plush campervans that can accommodate you and a friend, or a whole family. There are campervan models with popup tents that can easily sleep five. Many are available with a little kitchen in the back of the van, complete with an eskie, a gas-fired cooker, and even a little sink to wash the included pots and pans. It’s an inexpensive go-anywhere, do-anything solution to your vacation plans. If you’re going to stay in Sydney for a few days, why not rent your campervan early and save on hotel rates? You can camp at the BIG4 Lakeside Holiday Park near Narabeen Beach, or go to the Lane Cove Tourist Park, where you can use the nearby train station to get into the centre of the city. Before you head out on the open road in your campervan rental, Sydney has plenty of things to do and places to explore. The city has everything from sedate art galleries to sun and fun at Bondi beach. If you’re into nightlife or fine dining, you’ll quickly discover that Sydney has all the amenities of a truly world-class city. You can head to the area Sidneysiders call the Circular Quay, or simply The Rocks. It’s the oldest part of the city, and it’s loaded with little pubs, restaurants, and galleries. When the sun goes down, make your way to the observatory for a night of stargazing. You can walk to the famous Sydney Opera House for a dramatic sunset view. If you want a simple picnic, try the Botanic Gardens. Everything is within walking distance. Cockle Bay has a big wharf full of nightspots and eateries, with an unbelievable view of the harbor and a ringside seat for fireworks shows. If you have little ones along with you, there’s a water park, the Sydney Aquarium, and a zoo. Press on to Chinatown for Chinese cuisine and the best shopping in the city. No trip to Sydney is complete without a trip to the famous Bondi Beach. The beach’s turquoise surf and stark white sand make it one of the most beautiful ocean playgrounds in the world. Bondi’s the place to see and be seen, but if you’re not into crowds, you can take the coastal walk to Tamarama Beach, Clovelly, or Bronte Beach. You can get your campervan rental Sydney adventure off to a great start with day trips around the city. Sydney is a big city with lots to do, but it’s also centrally located between three important national parks. All three are within an easy drive using your campervan rental. Sydney is only 30 minutes away form the Kuring-Gai Chase National Park. It has many places for a campervan to park and picnic, and amazing ocean vistas will surround you everywhere you go. The park is a great place to go rowing, take a run or a walking tour, ride your mountain bike, or try a horseback tour of the park. There’s amazing whale watching from the cliffs in the right seasons, too. Your campervan rental Sydney adventure can continue with a trip to the Blue Mountains National Park. It’s just 90 minutes to the west of the city. If you love the outdoors, you’ll love the Blue Mountains. The park gets its name from the rich, blue color of the leaves of the eucalyptus trees that fill the park. The whole park is an adventure, with hidden swimming holes, plunging waterfalls, and acres of ferns that fill the openings in the forest canopy. The park has over 140 km of trails you can follow, and you can continue your adventure underground in the Jenolan Caves with their amazing stalagmites and stalactites. If you want to extend your campervan rental Sydney daytrip for longer than one day, Perry’s Lookdown Campground welcomes campervans. The Royal National Park is located one hour south of the city, still within easy reach of a campervan rental Sydney daytrip. You’ll enjoy sweeping vistas as you cruise along the coast road, with dense rainforest mixed in with scrubby surfside trees along steep cliffs. There are plenty of activities in the area, and tourists on a campervan holiday will find campgrounds, toilets, drinking water, and even showers at the park. For a real campervan rental Sydney adventure, you can travel north along the Pacific Coast toward Brisbane. This Gold Coast drive can be made in 10 hours of steady driving, but it’s perfect for an entire week of campervan touring. Just off the main road are opportunities for swimming, boating, or surfing. The entire length of the Gold Coast is dotted with one national park after another. You can poke around in your campervan or get out and hike over the wild landscapes and see some of Australia’s most interesting wildlife, exotic plants, and beautiful birds. Your first stop can be the Myall Lakes National Parks, a perfect spot for campervan excursions. If you love kayaking, swimming, or hiking over rough terrain, the park offers something for everyone. All along the rest of the Gold Coast route, you’ll come to one scenic town after another, with low-key dining, alternative lifestyles, and lots to see and do. If you head south from Sydney, you enjoy one of the most wonderful campervan excursions available anywhere in the world. You can hug the coast from Sydney to Melbourne, a 1,200 km drive along the edge of the sparkling sea. The views are unparalleled, and at every bend in the road you’ll find another spot to swim, fish, boat, or just relax. There are numerous campsites along the route that welcome campervan travelers. Campervan rentals are a popular way to enjoy the scenic beauty of Southeastern Australia. You can rent a campervan for a few days, a week, or even lease if for up to a year. You can accommodate a whole family, or choose a smaller, less elaborate vehicle to save money and keep things simple. Whatever campervan you choose, you’re sure to have a memorable time during your campervan rental Sydney trip.